'What's that coming over the hill, is it a monster? Is it a monster?' 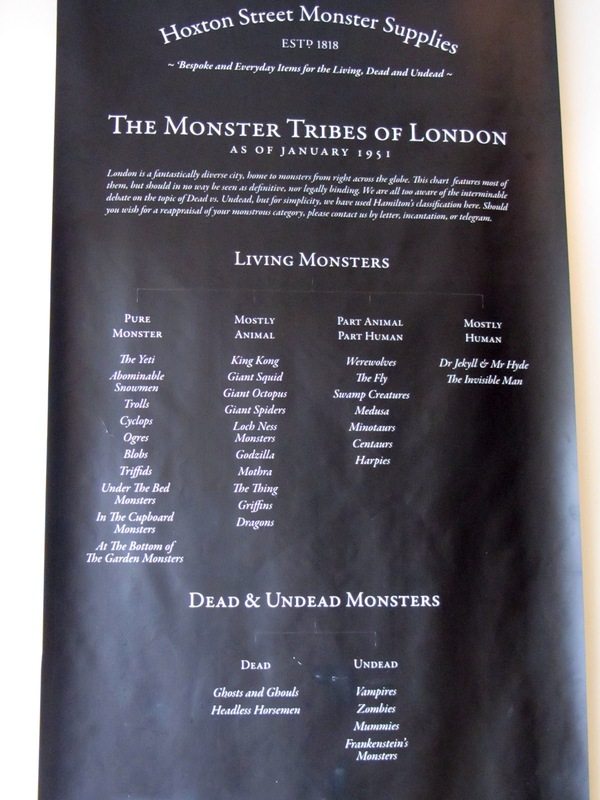 Well if you're in Hoxton, it's highly likely it is a monster, as there's a very special shop called Hoxton Street Monster Supplies - purveyors of quality goods for monsters of every kind. I know you're probably tutting in enormous disbelief, but it's true. I've been there and seen it with my very own hairy eyeballs. 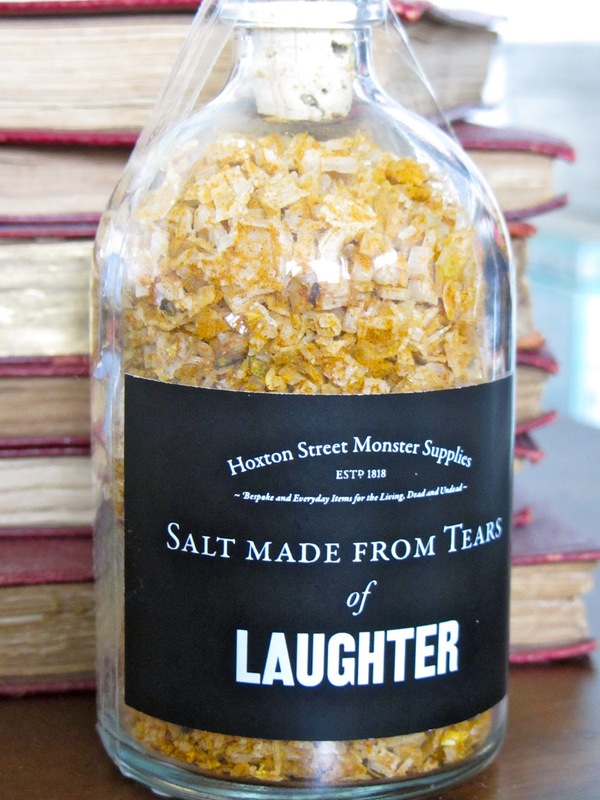 My secret sources tell me that Hoxton Street Monster Supplies was established in the spring of 1818 by its esteemed founder, Igor, who arrived in London during the harsh winter of 1817, having fled his home in Bavaria after an altercation with an unruly local mob. 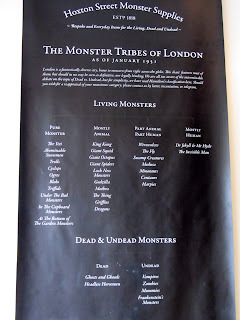 He was welcomed into the arms of the East End monster community, who helped Igor get back on his feet, and it was there that he decided to set up his monster supplies store in Hoxton. Now, you may or may not believe that story, and I won't deny I was a bit dubious at first, but as I wasn't around in 1818 (and I'm guessing you weren't either), who are we to question it. But the fact is the shop is very much there and has established itself as a true family business which has been handed down through many generations of Igors. It closed for a while, but after some much needed refurbishment (and the current Igor accepting it was time to install electricity), it re-opened in 2010 where it remains, serving monsters across the land. 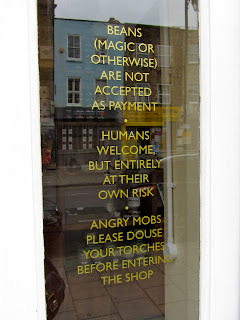 Humans are very welcome to enter the shop at their own risk, and as it says on the door, beans (magic or otherwise) are not accepted as a form of payment. My curiousity got the better of me, so I took a friend along (safety in numbers) to explore its wares. 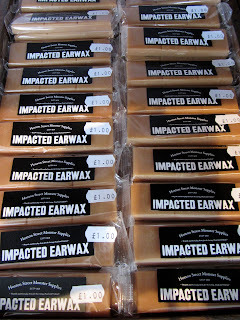 It certainly didn't disappoint as we stepped into a world of the most marvellous, hilarious and even downright gruesome items I have ever seen for sale. Large kilner jars full of pickled eyeballs, maiden's hair, fresh farts and extracted nails dominated the top shelves. 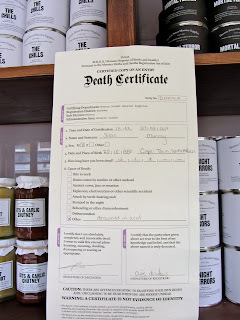 You'll find an interesting selection of human preserves including Organ Marmalade, Thickest Human Snot and Guts & Garlic Chutney. 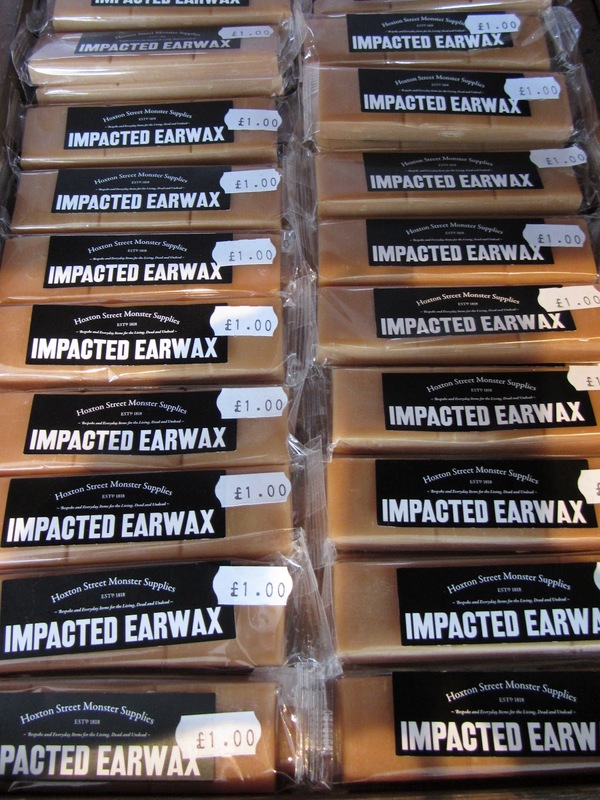 I couldn't resist getting a box of Cubed Earwax which to the human tastebud, has a close resemblance to fudge. There are also practical items available such as large rolls of Fang Floss, and one of my favourites, a pair of Neck Bolt Tightners which were sadly out of stock. For something extra special, you can even buy little jars with cork stoppers which contain salt flakes. 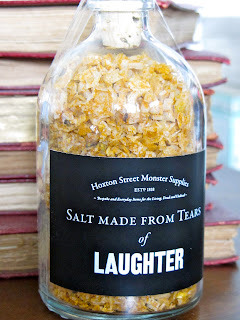 But these aren't any old salt flakes, as they're made with human tears of either laughter, anger, sorrow or onion-chopping. There is even a small pot which contains a crystal of Purest Joy which is so rare, it costs an 'eye-watering' £60 a pot. Only very posh monsters can afford such luxury! 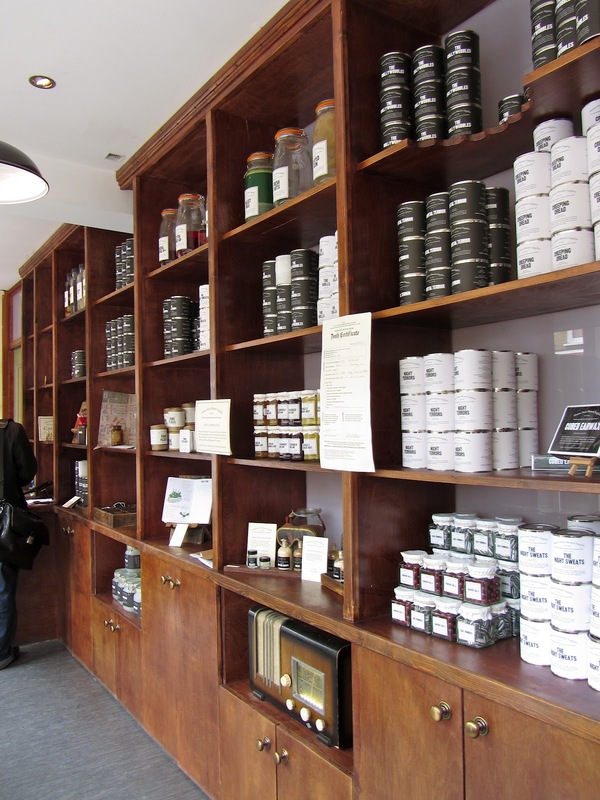 Aside from all the pots and potions, the shelves are stacked with a vast array of Tinned Fears. 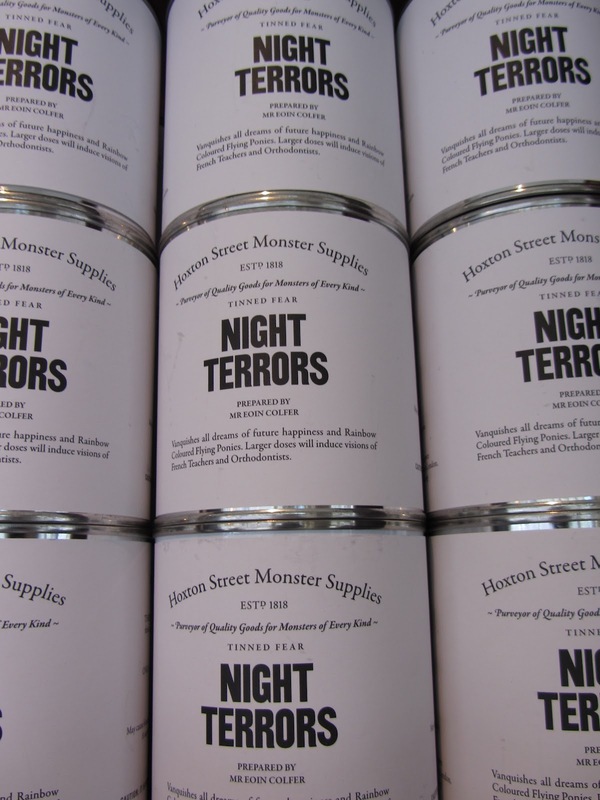 Be it a tin of 'Night Terrors', 'Heebie Jeebies', 'Colly Wobbles' or 'A Vague Sense of Unease', each one comes with some monster treats and a specially commissioned short story from authors including David Nicholls, Nick Hornby and Zadie Smith. 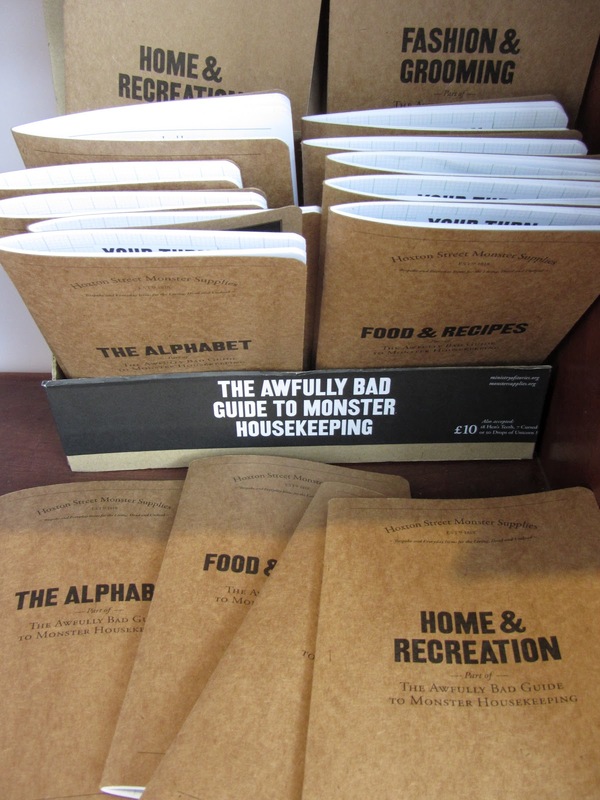 They're brilliantly designed with witty directions, and they make smashing presents! 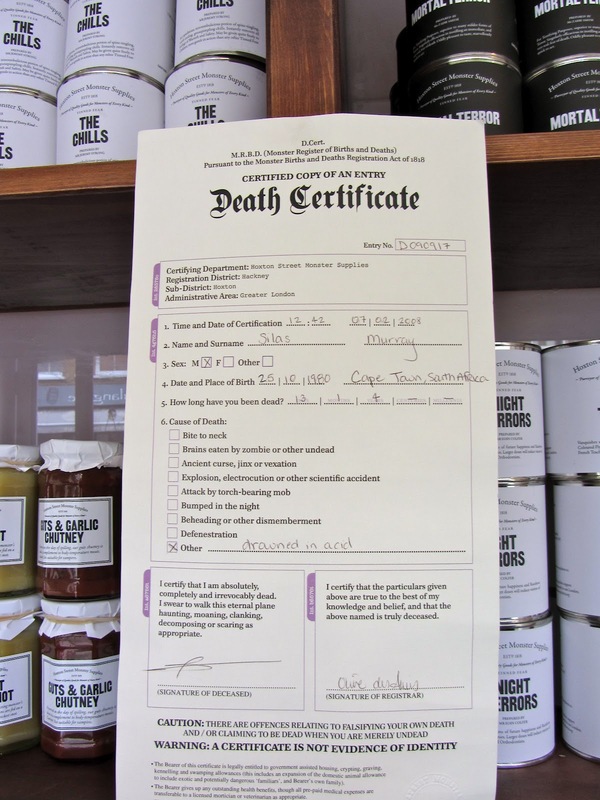 The Tinned Fears are all part of an exciting project called the Ministry of Stories. 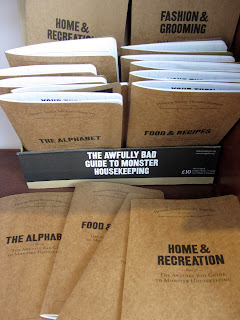 In fact, you may notice behind the shelves there is a hidden entrance which leads to the Ministry of Stories. This wonderful writing centre offers personal tuition for 8-18 year old youngsters who are keen to explore the writer within. 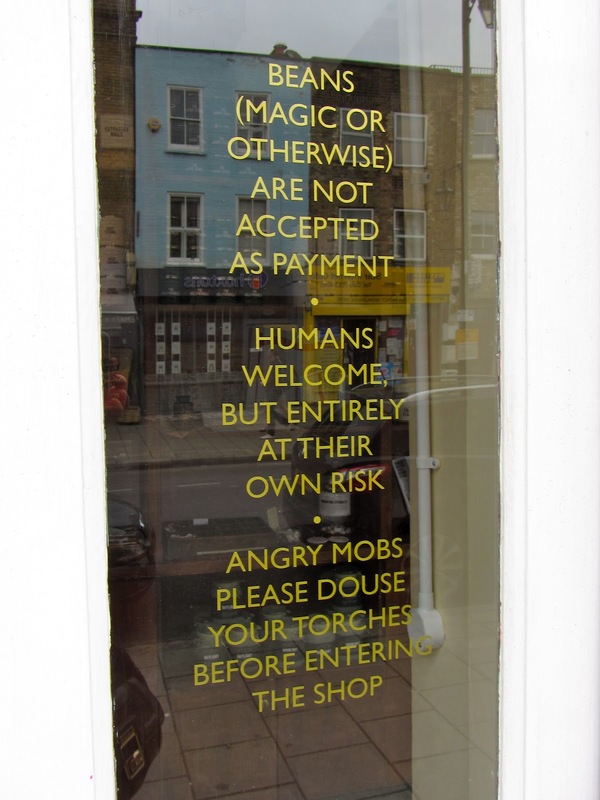 Having the magical element of the Hoxton Street Monster Supplies shop front is a fantastic way to inspire and engage the children's imaginations, whilst the income from Igor's wares, goes towards maintaining the writing centre whose services are mostly given by volunteers. The entire concept is just brilliant! So if you find yourself in need of a tin of Heebie Jeebies, a pot of brain jam or a pair of 3 eyed-specs, I can't think of anywhere better to go. 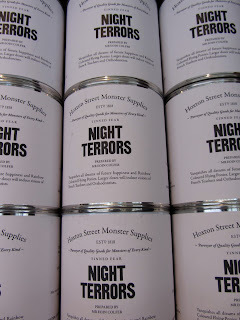 Hoxton Street Monster Supplies is without doubt one of my most favourite shops, not just in London, but in all the world. Now you all know what you're getting for Christmas! And if you see Igor, say hello from me. Fangs very much.